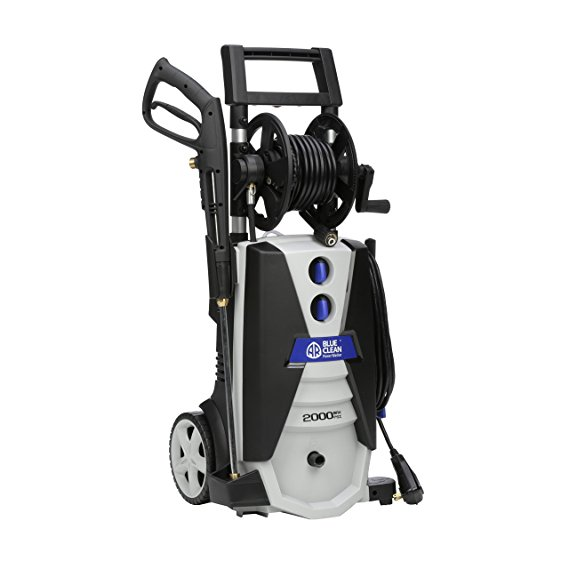 Next one is AR Blue Clean AR390SS Electric Pressure Washer. It is an upgraded version of AR390 model. It can generate powerful 2000 PSI and a pressure which is up to 30 times the normal garden hose and yet consumes 80% less water. For tough jobs you can attach the Turbo/Rotary nozzle which will increase the pressure exerted by spray up to 50%. The low pressure spray Soap (Black) nozzle tip can automatically start the detergent tank for easily spraying detergent application with help of spray gun. This pressure washer is lighter than most of the gasoline powered pressure washer and it i also very safe to use and certified by CSA for its high security standard. It is perfect for doing medium to heavy cleaning jobs and give the best results every time. Definitely one of the best electric pressure washer available today. Conserves water by using 80% less water with 45% more power than a standard garden hose. awkward/stiff power hose and reel.